I can vividly remember the first time I fell in love with wheat berry salad. It was a few years ago, James was on a business trip in London, and I had the opportunity to visit him for a long weekend. I had never been to London and was extremely excited to visit the famous Borough Farmers’ Market that I had been reading about for so many years. Now, often times reality does not live up to hype, but when I finally got to the market it was even more spectacular than I had imagined - table after table of locally grown vegetables, homemade cheeses, fresh eggs, artisan breads, exotic spices, aromatic prepared foods, and so much more. One of the most memorable vendors, The Arabica Food and Spice Company, sold a wonderful array of Middle Eastern inspired grain salads. I grabbed a small container of one of their wheat berry salads and made it my lunch. The truth is, I couldn’t tell you every last ingredient that went into that salad, but it was truly delicious. For sure there are lots of wonderful sights and tastes in London; but my visit to the Borough Farmers’ Market was one of my favorite stops and that salad one of my most memorable meals. 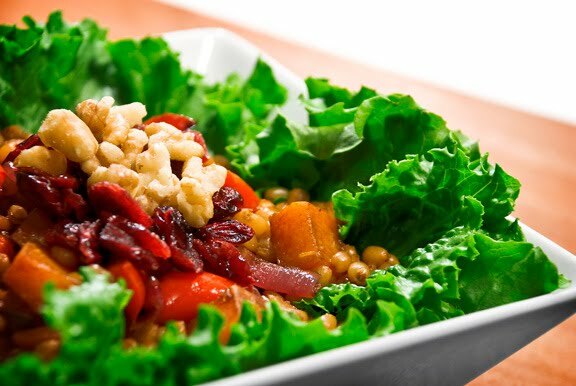 Wheat berry salad sounds super healthy (and it is), but you have to be careful. Indeed, wheat berries are nutrient and protein packed, but being a carbohydrate they’re also very high in calories. I make several different kinds of wheat berry salad throughout the year, but to help cut the calories I always include plenty of seasonal vegetables in the mix. In this recipe I incorporate roasted butternut squash and red peppers, making this salad very earthy and rustic. Add some crunch to this salad by serving a few tablespoons a top a handful of lightly dressed lettuce leaves. Finally, as an optional treat, add some dried cranberries and toasted walnuts. *Cook the wheat berries according to their package directions, or boil in water for approx. 1 hour and drain off excess water. In a large bowl combine the red bell pepper, red onion, butternut squash, ¼ cup balsamic vinegar, and salt. Toss to coat all the vegetables evenly. Pour the vegetable onto a foil lined baking sheet. Roast until tender, approx 45 minutes, tossing the vegetable every 15 minutes while baking. Rinse out the bowl you used earlier and whisk together the garlic, orange zest, orange juice, olive oil, maple syrup, black pepper, and remaining 2 tablespoons of balsamic vinegar. Add the roasted vegetables and wheat berries and toss to combine. Taste and add additional salt, black pepper, and balsamic vinegar to your taste. Serve warm or at room temperature a top a handful of lightly dressed lettuce leaves. If desired, sprinkle some dried cranberries and toasted walnuts on top. Made this for dinner tonight. Great combination of flavors - especially like the walnuts and dried cranberries with the orange and balsamic. The last bite I took before putting the leftovers in the fridge was even better. Can't wait for lunch tomorrow! Melissa, I love the story behind this recipe! As usual it sounds and looks delicious! SO delicious! I just made this (rather a variant on it with millet instead of wheatberies) and it's the best thing I've made in a long long time. And I forgot to put the nuts and cranberries on it. Definitely getting made again!